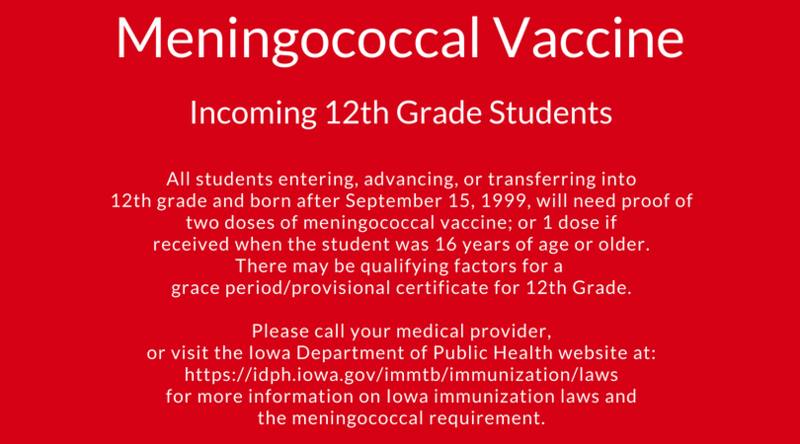 Iowa State law requires every student have a completed immunization record on file at the school by the first day of school. 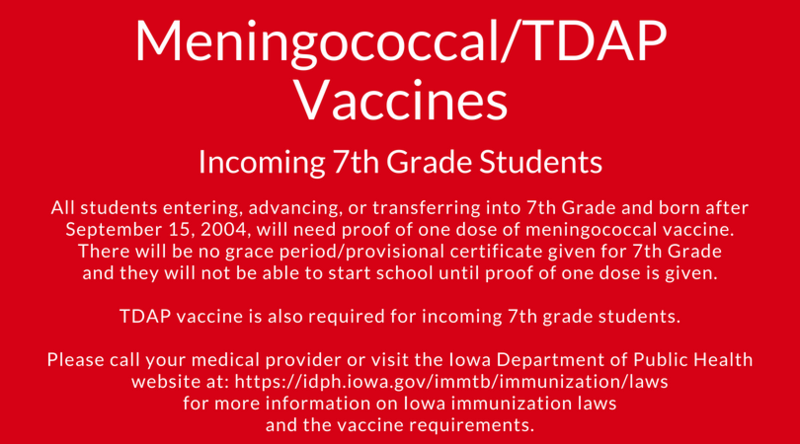 If immunizations are in process or the student is transferring schools, the child is enrolled in school on a provisional status. The law allows 60 calendar days for completion and documentation of immunizations. All immunization records are audited by the Black Hawk County Health Department. Call 319-291-2413 for an appointment. With 1 dose received at or older than 4 years of age if born on or after September 15, 2003; or 4 doses, with 1 dose received at or older than 4 years of age if born after September 15, 2000; or 3 doses, with 1 dose received at or older than 4 years of age if born on or before September 15, 2000. With 1 dose received at or older than 4 years of age if born after September 15, 2003; or 3 doses, with 1 dose received at or older than 4 years of age if born on or before September 15, 2003. The first dose shall have been received at or older than 12 months of age; the second dose shall have been received on or after 28 days after the first. If born on or after July 1, 1994. At or older than 12 months of age if born on or after September 15, 2003; or 1 dose received at or older than 12 months or age if born on or after September 15, 1997, but born before September 15, 2003, unless the applicant has a reliable history of natural disease.